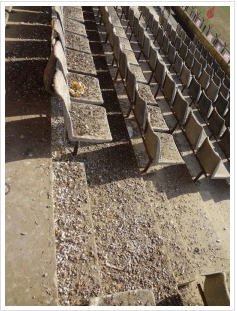 Orissa’s top circulated daily, the Sambad, has made a five-column caption in its May 27 Bhubaneswar edition on how five thousand chairs in the Kalinga Stadium are rendered unusable because of heavy deposit of pigeon droppings on each of them, in the galleries. When in 2011, thousands of valid ticket holders could not occupy their seats to witness Odissi Dance performance by record number of artists that launched the pride of Orissa into the Guinness Book of World Records, because of the filth deposited on the chairs, one of our esteemed readers, Ms. Aradhana Mishra had sent us pictures of the chairs heavily littered by the bird droppings. That was to our pages on discussion on Odissi on 29 december 2011. Sadly, no other media thought it prudent to highlight this harm to the stadium. 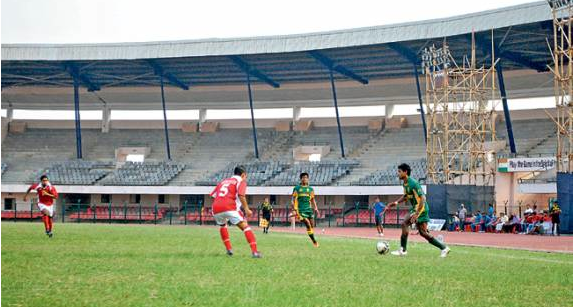 After six months thereof, Orissa’s most popular newspaper Sambad has made this issue the crux of the report on Kalinga Stadium. We will fail in our duty if we fail to thank Ms. Mishra for having exposed this matter for the first time in our pages last year. The government run by Naveen Patnaik is so full of filth that we cannot say for certain that the filth in the Kalinga Stadium would appear to it as alarming. But we are happy, that the issue which we had highlighted has started being reflected by mainstream print media in Orissa.